Much of the Twin Cities metro area was simply closed on Tuesday night. While it was hardly the worst snowstorm in history--not even close, by midafternoon driving was treacherous and the forecast of blizzard conditions convinced many clubs and event centers to shut down for the night. 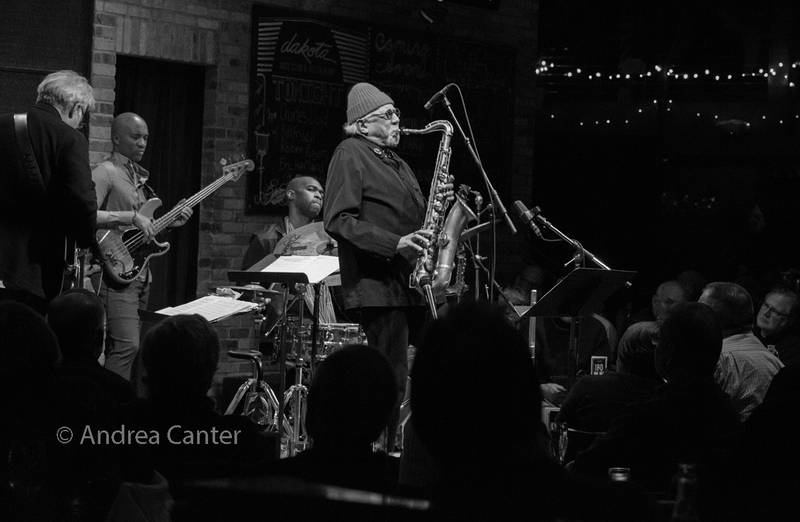 The Pete Whitman X-Tet was pre-empted at Crooners; Chris Lomheim and Fuzzy Math were closed out at Vieux Carré; Big Band Night became No Band Night at Jazz Central. 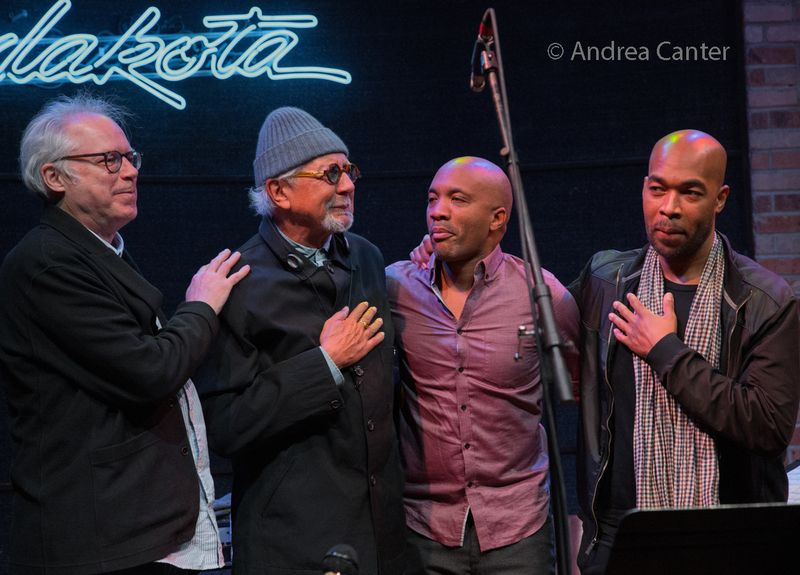 But at the Dakota in downtown Minneapolis, the prevailing attitude was "the show must go on." Fortunately the musicians had arrived ahead of the storm. 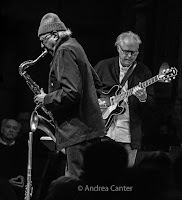 And it would have been a tragic loss to the sold-out crowd--most of whom made it to the show--had the club shut down a most eagerly anticipated night with Charles Lloyd and Bill Frisell, each a working legend in his own right. 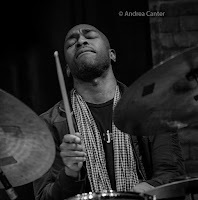 With bassist Reuben Rogers and drummer Eric Harland --frequent associates of Lloyd, this ensemble has been gaining momentum over the past two years, sometimes as a quartet, sometimes as a quintet ("Marvel"), adding pedal steel expert and longtime Frisell collaborator Greg Liesz. 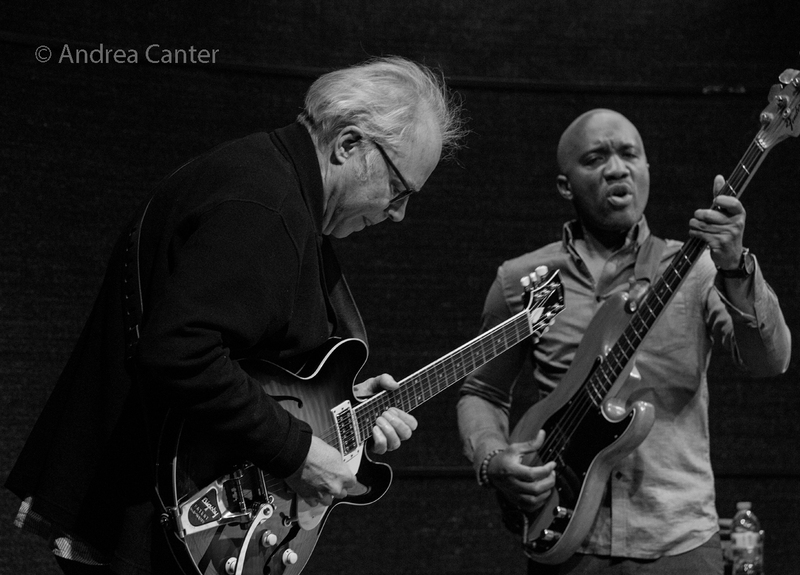 Neither Lloyd nor Frisell are strangers to the Twin Cities or the Dakota, as each tends to find his way here every year or two, and both brought strong shows to the Dakota in 2015. But put these icons together -- "spontaneous combustion" does not really convey the brightness of the sparks, the height of the soaring sky rockets, the intensity of the camaraderie, or the transcendence of the spirits. Four artists held the attention of 200+ listeners (and indeed, this was an audience of listeners!) 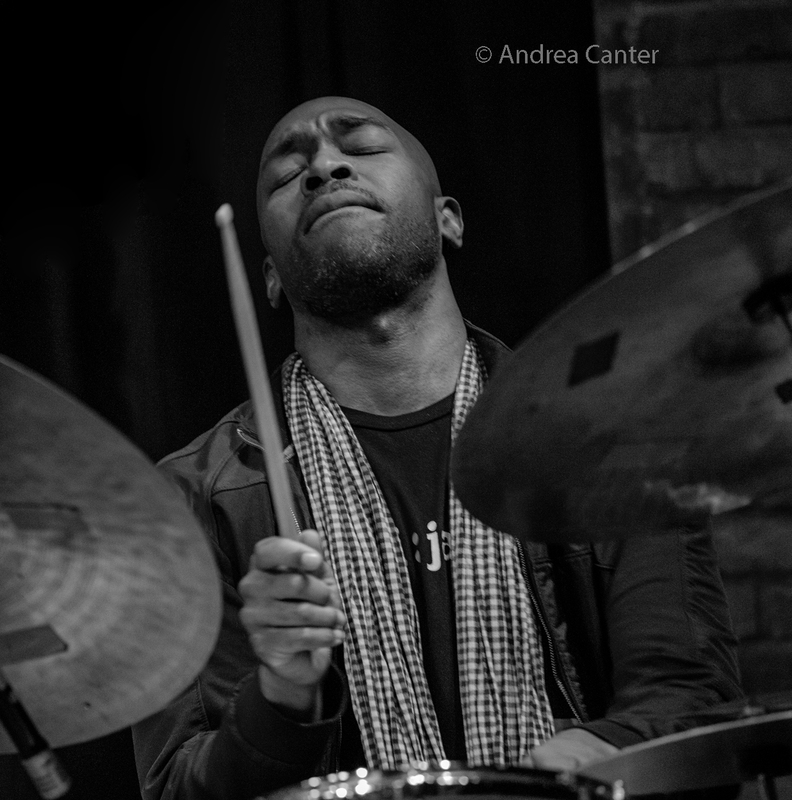 for nearly two and a half hours of a single set, many of the tunes folding into each other as a grand jazz epic. Frisell and I are about the same 60-something and I can't imagine standing on stage that long, with or without performing. Lloyd is 77 and a leading force on every tune, mostly played this night on tenor, taking breaks only to yield the magic wand to his pals while sitting back, briefly, to urge them to higher and higher glory. Rogers and Harland are in their 40s, but in no way out-gunned their elders. 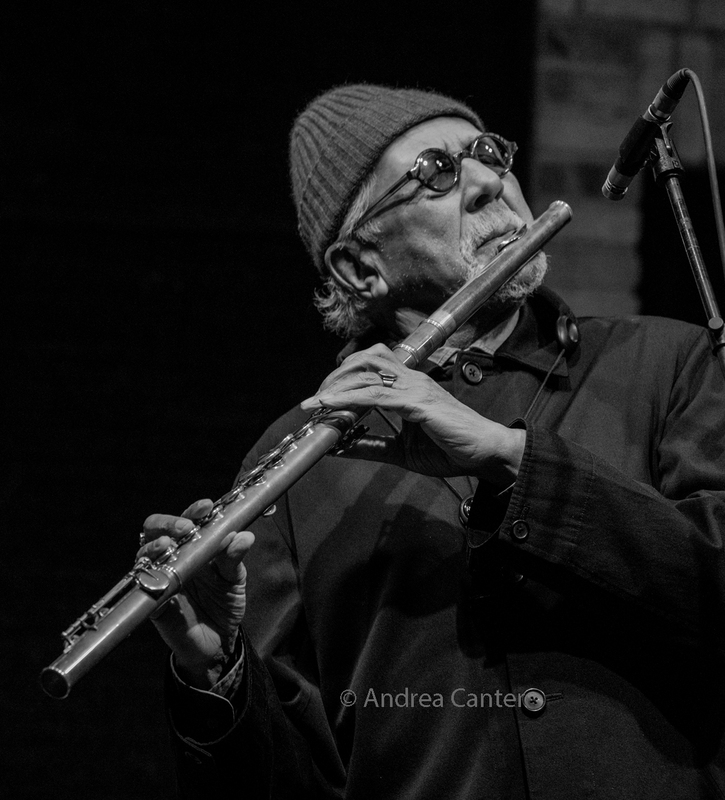 The setlist itself --never announced--was drawn from the history of jazz and the global roots of all music, not at all unusual for either Lloyd or Frisell who are both geniuses of interpretation and reinvention. There were plenty of post-bop exchanges, as well as hints of Middle Eastern and European folk, country blues, Latin syncopation, spirituals and gospel, Americana and 60s pop, with unique takes on such familiar fare as "Shenendoah," "In My Room," "Abide With Me," and the stunning final encore, "You Are So Beautiful." Yes, a third encore (or was it four?). Neither the audience nor the band wanted to call it a night. Some highlights were as much visual as aural, particularly the interaction among pairs-- Lloyd and Frisell of course, eyeing each other and smiling throughout; the two stringmen, Frisell and Rogers, as if dueling with the utmost respect while each determined to reach Nirvana first. And Harland always driving the bus but eager to find each of his cohort's preferred highway. In the end, sound is everything, and every sound contributed to the journey, solo or in tandem or in full ensemble harmony. And no one was happier with the results than the four musicians on stage. But those of us in the audience were close behind. The storm was pretty much over by the end of the show and really was not all that memorable. We'll probably have a few more like it before the season ends in April. As for the musical experience this night at the Dakota, I only hope I have a few more like it ... period. To quote Abbey Lincoln, "music is the magic of a secret world," and every once in a while, we stumble upon an ensemble that brings us into that world.